If we’re lucky, then in just a few days time we could witness one of the most spectacular sights in the night sky for a generation or more. Astronomers hope that on 3 December a comet will appear on the eastern horizon – Comet Ison. 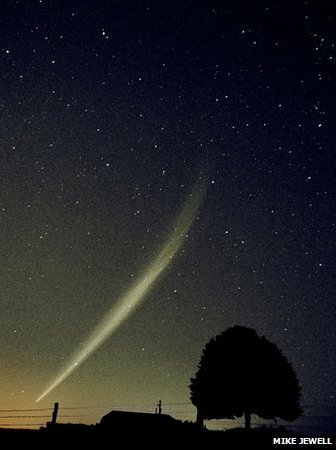 For the whole month of December, millions of people across the northern hemisphere should be able to see its tail, which is several millions of kilometres long, stretching across the dawn sky. Ison has come from the Oort cloud, a belt of comets on the very edge of the Solar System, where it has been for the last 4.6 billion years. What makes Ison so special is that it is a “sungrazer”. 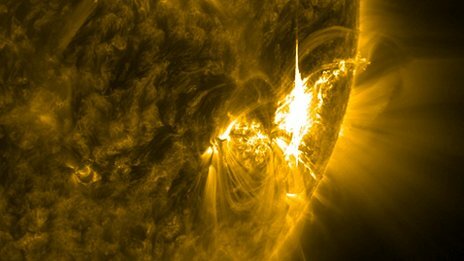 Many comets pass through the Solar System every decade, but very few go through the corona of the Sun. Ison will do just that. Its passage through the corona, which happens on 28 November, will be watched with great interest by astronomers across the world. It’s not known exactly what effect the great heat and gravitational force of our Sun will have on the comet. Dr Matthew Knight, from the Lowell Observatory in Arizona, has been watching the comet for the last year and has worked out three scenarios to describe what Ison might do in the coming week. Scenario one: It could suffer the same fate as Comet Lovejoy, which went around the Sun in autumn 2011. The gravity of the sun pulled one side of the comet’s nucleus more strongly than the other, stretching it apart. As Lovejoy emerged from the corona it exploded. Whether this will happen to Ison depends on its size. A nucleus of two kilometres or under puts it at great risk. Astronomers estimate that Ison is almost exactly two kilometres, so it’s right on the borderline. In scenario two, Ison might behave like Comet Encke. This comet has orbited the Sun about 70 times since it was first observed a few centuries ago. It is fast using up its ice and gasses and is fizzling out. Although Ison is only going to pass the Sun once, Dr Knight fears it could suffer the same fate. Then there is the third scenario, the one many people will be hoping for. This is what happened to Comet Ikeya-Seki in 1965. As the comet went through the sun’s corona, the heat ignited the gases deep in its nucleus and a few days after it emerged from the corona, a huge tail had developed behind it. Millions of people were thrilled by the great spectacle. If Ison puts on a stunning display as Ikeya Seki did, then it will also help scientists answer some of the great questions about our origins. Since 1965, telescopes and imaging technology have advanced enormously. 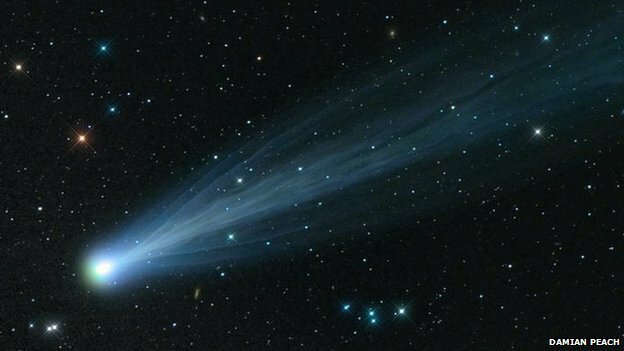 Spectrometry will allow astrochemists to analyse the chemical composition of the ices in Ison and from that data try to work out how the Solar System formed 4.6 billion years ago. They might even be able to study its water signature, to provide crucial data informing the argument about whether our water came to Earth on comets, or accretion from below our planet’s surface. There is even a chance that scientists will observe the chemical precursors of amino acids. These amino acids are the molecules that form the building blocks of life. Experiments in the laboratories at Nasa Ames, in northern California, have shown that these building blocks of life can be created in the hostile environment of a comet’s nucleus. Could comets be the agents that transport these building blocks across the cosmos? Everybody can now follow the comet’s progress on the internet. Here’s hoping that Ison will be talked about for years to come – as the comet of the century.